How do you spell Peyton? P E Y T O N.
Please note that there is no “A”. What is the origin of the Peyton Heart Project? The Peyton Heart Project was co-founded by Jill Kubin and Sue Harris in 2015. Its mission is to help stop suicide and bullying and to help end the stigma surrounding mental health issues. ~To bring awareness to the issues of teen suicide and bullying. ~To get people talking about these issues. ~To show people that their lives are worth living and that every life matters. Does your project only take place during specific months? The Peyton Heart Project is year round. There is always something going on. Can I make and scatter hearts where I live? Yes. If you want to make your own hearts and tags to scatter where you live you will need a file that has the quotes and the hashtags. The files are posted on the Tags page. You must use the quotes that we provide for the Peyton Heart Project. What if I want to bring The Peyton Heart Project to my community? If you schedule an event, we would love it if you would let us know about it in advance, and please send us pictures of the event afterwards. How much do the hearts cost if I want some sent to me so I can scatter them myself? Would I be able to pick out the colors I want when you send me hearts? Sorry, but no. We have a very limited stock and we don’t have a way to fill specific color orders. Are you accepting donations of hearts? Yes! In fact, we need as many hearts as you can send. We are accepting donations of hearts at both our New Jersey and Texas locations. Please do not make any hearts made of angora or mohair. Many people are allergic. We are, too. ~All other colors (but not black) are also welcome and desperately needed! These are the ones we send to people who want to scatter hearts but don’t know how to make them. Why don’t you want solid black hearts made? Black hearts are sometimes seen as a negative symbol. They can represent grief, sadness and anger. That is why we are trying to keep that color out of the project. We don’t mind if it is in the heart with other colors but as a solid we ask that people not use it. YES! We are now set up to accept donations through checks or PayPal. WE HAVE A NEW MAILING ADDRESS!!! Please note that we will charge you $25 for a returned check. Also note that while we ARE a Non-Profit organization, we do not have 501(c)3 tax-exempt status. Do you accept yarn donations? We do not need yarn at this time. Yes! We accept brightly colored yarn (no black, no mohair, no angora please). How often do you go to the Post Office? About once every 7 to 10 days. Where do I get the quotes for the hearts? All tags are listed on our TAGS with Quotes page. Please use only thick paper to print out the tags, like heavy duty card stock, at least 65lb (176g/m2). Ordinary printer paper is just not strong enough. Do you have any knit or crochet patterns for hearts? Why do you use a hashtag on each heart? When someone finds a heart that we put out in a public place, they tend to want to know the story behind it. Having the hashtag #PeytonHeartProject on a tag attached to each heart gives them the opportunity to Google the project so that they can learn what it is all about. ~The correct hashtag to use when making hearts for the Peyton Heart Project is #PeytonHeartProject. 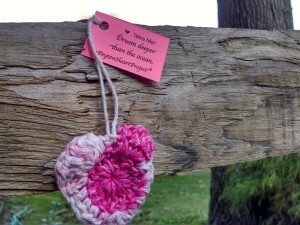 Please do NOT use #ThePeytonHeartProject. It will not lead people back to our social media pages if you include “The”. What are the Photo Sharing Terms and Conditions? BY POSTING CONTENT IN CONNECTION WITH THE #PEYTONHEARTPROJECT HASHTAG (EITHER BY DIRECT UPLOAD OR BY POSTING TO A SOCIAL MEDIA SITE USING THE #PEYTONHEARTPROJECT HASHTAG), YOU ARE REPRESENTING THAT YOU AGREE TO THE TERMS OF THE PEYTON HEART PROJECT AND THAT YOU WILL COMPLY WITH OUR REQUIREMENTS. YOU ALSO AGREE THAT YOU ARE AT LEAST EIGHTEEN (18) YEARS OF AGE. How do I submit photos to the Peyton Heart Project? It’s easy! Simply snap a clear photo of your heart and tag it #PeytonHeartProject. Then share it on Instagram, Twitter, or Facebook. By using the #PeytonHeartProject hashtag or uploading your photo to the Peyton Heart Project’s Facebook page, or e-mailing your photo to the Peyton Heart Project, you acknowledge and give your consent to the Peyton Heart Project that your photo(s), city, state, and likeness may be used by the Peyton Heart Project. You further represent that you are at least eighteen (18) years old, and that your photo(s), social media handle, and any associated caption will be considered a “submission” and that you will not be compensated financially for your photo or caption. I don’t know how to knit or crochet. Is there any way I can still help make hearts? You don’t have to knit or crochet the hearts. We actually make some of our hearts by wrapping yarn around heart-shaped cardboard. For example, from a cereal box. If you have trouble with the yarn slipping off the rounded edges then you can switch to corrugated cardboard. Here is the simple pattern. Please be sure to leave a 5-inch loop (12 cm) at the top of the heart so a tag can be attached to it. Is it okay to sell Peyton Heart Project hearts for any reason? No. Our hearts have always been and will always be free. No one is permitted to sell hearts that have the Peyton Heart Project name on them. The point of our project is for people to find the hearts and to be inspired by how the experience makes them feel. Selling them would get in the way of what we are trying to do. This includes offering them for a “donation” of any amount, no matter where the proceeds go to. Free means free. ***All files and the content within the files that we send to you or that you download from our site are the sole property of the Peyton Heart Project. Duplication for any purpose other than for the Peyton Heart Project is prohibited. When you download our files you are agreeing not to use these files for any purpose other than for making tags for the Peyton Heart Project and scattering hearts for the Peyton Heart Project. You also agree not to alter the files in any way, or to recreate the files in any other format; layout; font; color; or content. ***When scattering hearts it is your responsibility to know what the laws are regarding leaving things in public in the locations you are putting them in. The Peyton Heart Project is not responsible for hearts left in locations where they are not permitted to be left. Please do not insert hearts or tags into vending machine slots or ATM slots or gas pump slots or any other card reader or money slot. It can jam the machinery. Please be advised that our hearts cannot be left in mailboxes for people to find unless they have gone through the postal system with postage on them. Please pay close attention to all laws and regulations when you are scattering your hearts, for example, No Trespassing! Rules are subject to change. We suggest that you check back periodically to read them.